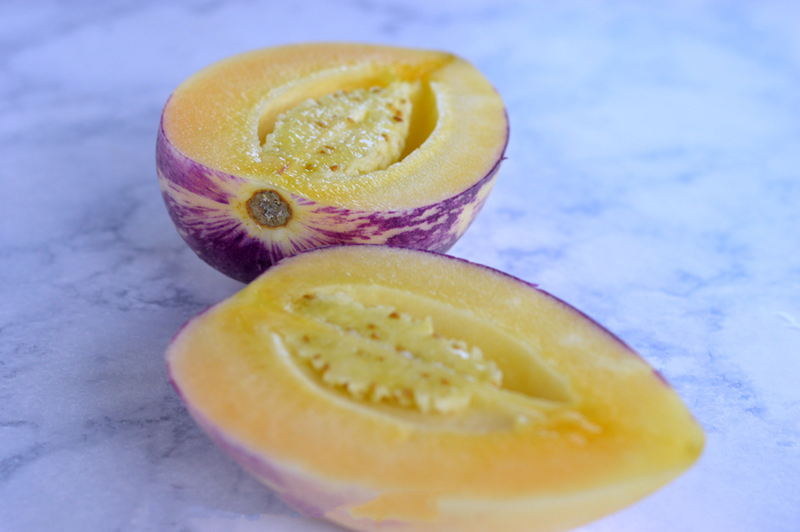 Pepino melon scientifically known as Solanum muricatum is a small bush or shrub belonging to the nightshade or Solanaceae, the same family as potatoes, tomatoes, eggplants, bell peppers and chili peppers. The plant is native to temperate Andean regions of Colombia, Peru and Chile. 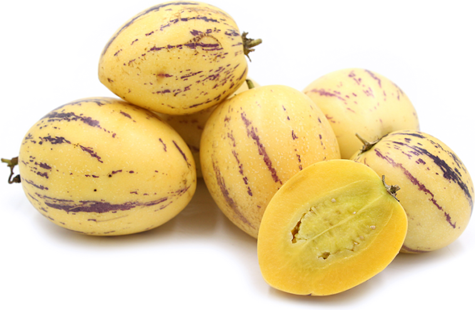 Today pepino dulce is cultivated mostly in the mountains of Latin America, in New Zealand, East Africa, East Asia, Australia, in the Canary Islands and in the Mediterranean region. 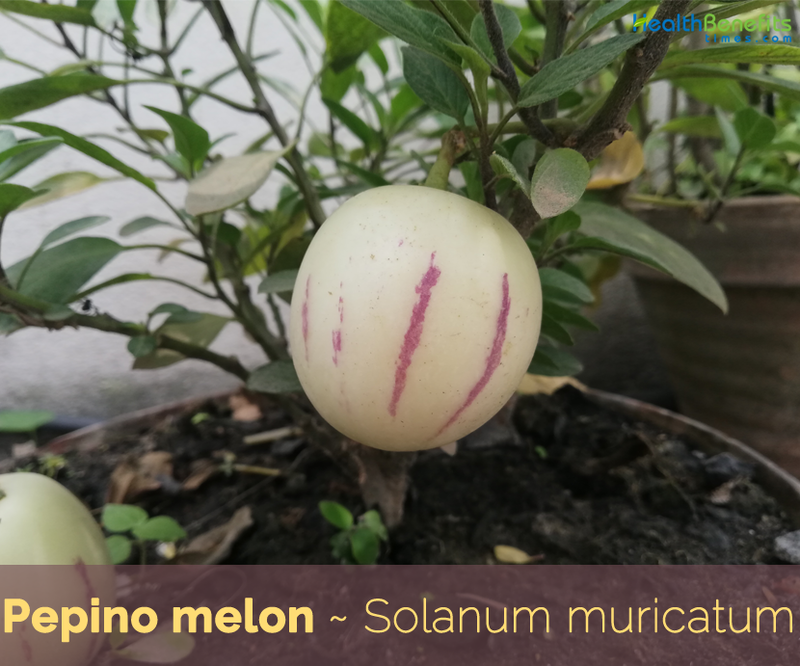 Few of the popular common names of the plant are tree melon, bush melon, melon pear, mellow fruit, pepino dulce, Pepino, Melon Pear, Melon Shrub and pear mellon. Despite its name, Pepino melon is not actually a melon. As a matter of fact, it is a South American fruit that is closely related to the eggplant and tomato. Another fun fact: The pepino gets its name from the Spanish word for “cucumber” due to some similarities of taste and texture between the two. 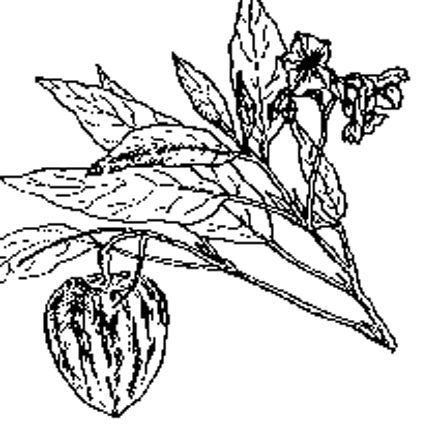 However, this member of the nightshade family is sweet when ripe, earning it the modern moniker pepino dulce. 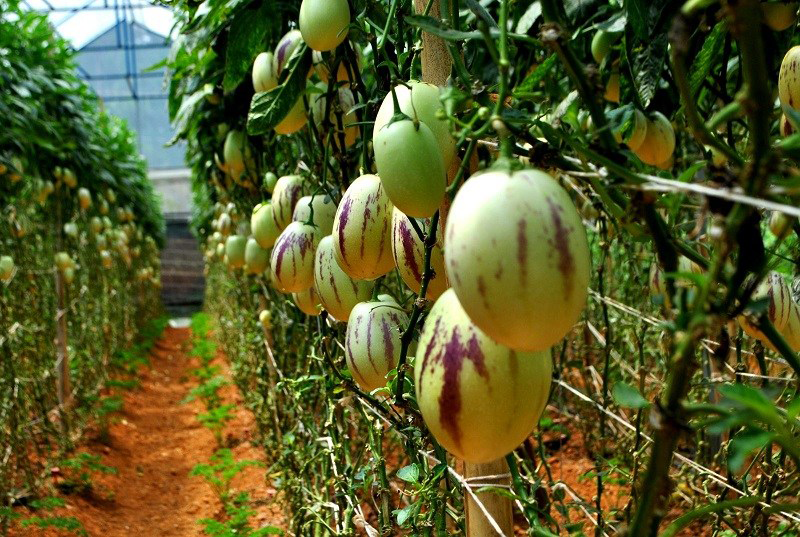 Pepino melon is a semi-dense, unarmed, short-lived, evergreen sub-shrub that grows about 1-2 meters tall. The plant is found growing in sunny or semi-shaded, frost-free location, sheltered from strong winds. The plant does best in a fertile (but not too fertile), free draining, neutral soil. It is not as tolerant of salinity as the tomato. If the soil is too fertile fruit production will suffer due to excess vegetative growth. The plant has fibrous root system. The bright green leaves are sparsely covered with very small hairs. 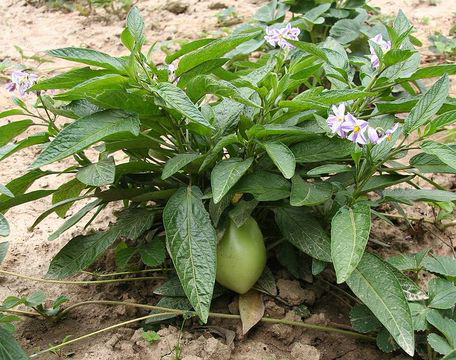 In appearance the pepino dulce is much like a potato plant, but the leaves may take many forms–simple and entire, lobed, or divided into leaflets. 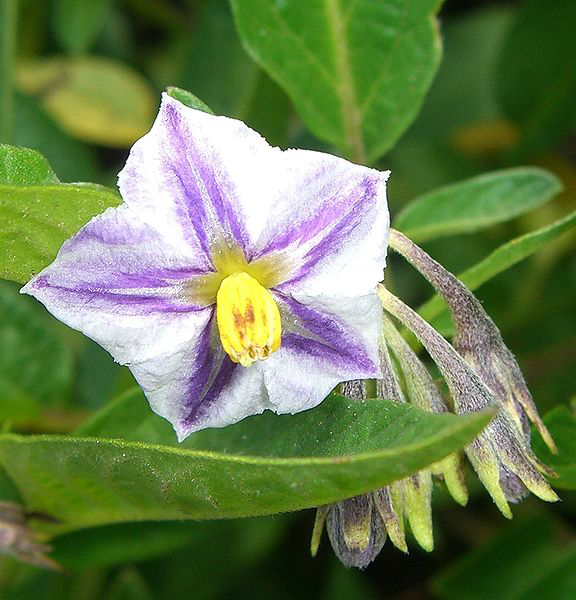 The small flowers are blue, violet-purple or white marked with purple, and are similar in form to unopened potato flowers. The pepino dulce is considered to be parthenocarpic but a much heavier crop results from self-pollination or cross-pollination. The plants will not set fruit until the night temperatures are above 65° F. Flowering normally takes place from August to October. Flowers are followed by delight fruit. The fruit show considerable diversity in size and shape. In the areas of its origin there are small oblong types with many seeds, while others are pear or heart-shaped with few or many seeds. Still others are round, slightly larger than a baseball and completely seedless. The colors also vary completely purple, solid green or green with purple stripes, or cream colored with or without purple stripes. The fruit are usually round to egg-shaped, about 2 to 4 inches long, with some growing up to 6 inches. The skin is typically yellow or purplish green, often with numerous darker streaks or stripes. The flesh is greenish to white and yellowish-orange. Better quality fruit is moderately sweet, refreshing and juicy with a taste and aroma similar to a combination of cantaloupe and honeydew melon. In poor varieties there can be an unpleasant “soapy” aftertaste. The fruit matures 30 to 80 days after pollination. Seeds start ripening from September to November. Pepino melon is native to the South American Andes, where it was central to the Incan diet in pre-Columbian times. Many pepino-shaped vessels, amulets, and other ornamental have been excavated from Incan sites. By the time the Spanish arrived, the plant was already widespread throughout the Incan empire, which included Peru, Ecuador, northern Chile, and parts of Bolivia (Prohens). The pepino also made a big impression on the Spanish, who spread the fruit throughout South and Central America. The pepino was widely introduced to Europe in the 18th century, spreading from Spain to other countries. The pepino was also grown in the California and Florida by the late 19th century. It has since become an important commercial crop in New Zealand, Chile, and California and is an especially popular fruit in Japan. 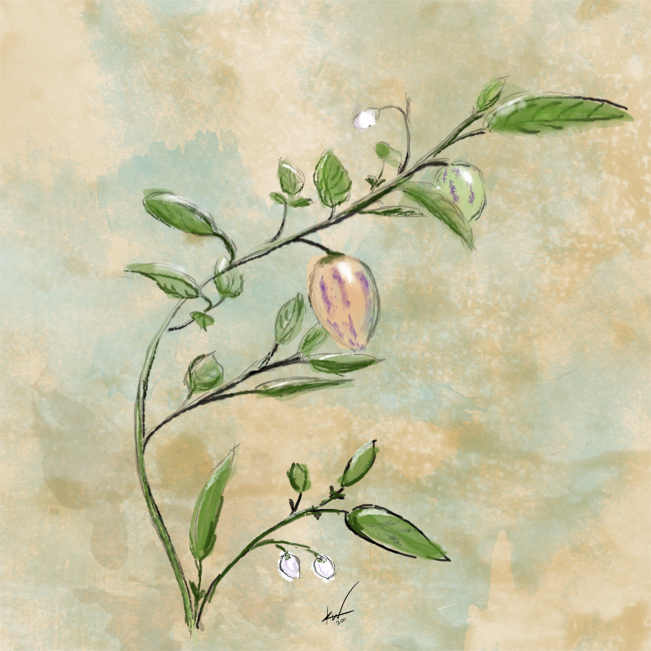 It is a very large fruit, mostly cream-colored with light markings of purple. It is very juicy and sweet, free of soapiness, of good melon-like flavor, particularly when vine ripened. It is self-fertile, but yields larger fruit when cross-pollinated. A market cultivar in South America that produces good crops of pear-like fruits over a long growing season. The fruit has an attractive color and is well-marked and holds well on the plant. It is self-fertile, but should be thinned for better fruit size. It is a medium to large, egg-shaped fruit with regular purple stripes. It sometimes produces off-flavored fruits recognizable by their brownish-green color. It is one of two leading commercial cultivars in New Zealand. Fruit is creamy white with a faint salmon glow, lightly striped with purple. Flesh is deep salmon. Flavor is rich, sweet and aromatic, with no soapiness. Few or none seeds are present. The fruits mature early. It is a strong growing plant, bears well without pollination. It is a medium to large, oval fruit, apex pointed. Skin is smooth golden yellow when mature, prominently striped with deep purple. Flesh is firm, juicy, and yellow-orange. Flavor is sweet, virtually free of soapiness. Few seeds are present. The fruits can be kept for several weeks. It has upright growth habit. Sets fruit well without cross pollination. The fruit is named after the city in Ecuador where the original plant was collected. 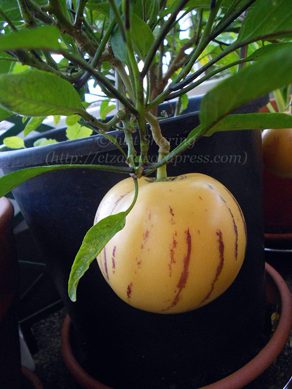 It is a medium-sized fruit, strongly striped with purple with wonderful flavor. The plant has vining growth habit, making an excellent climber or a hanging basket plant. 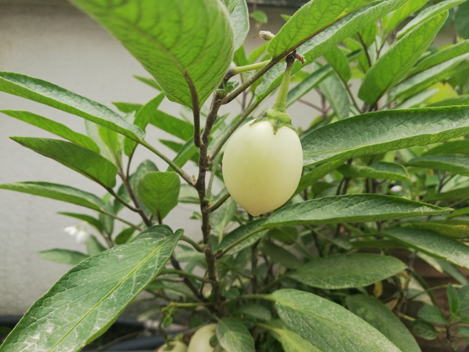 It has dark-green leaves with reddish-purple veins, purple stems. Flowers are darker than normal, making an excellent display. The plant was introduced by the Nurserymen’s Association of Western Australia. The plant has large, high quality fruit. It is a medium-sized, oval fruit, 4 inches long, 3 inches in diameter, apex pointed, shoulder well rounded. 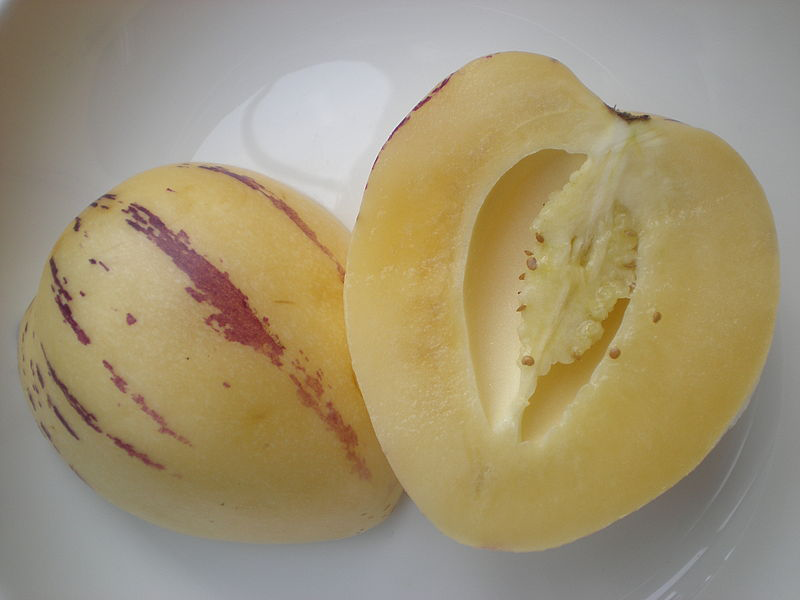 Skin is smooth, cream-colored when ripe, prominently striped with dark purple. Flesh is firm, light cream in color, very juicy. Flavor sweet and refreshing, with ho hint of soapiness. Seeds are usually present. Keeping quality excellent. An important export cultivar in Chile. It is a cross of Rio Bamba and a seedling from South America. Medium-sized fruits have good flavor and aroma. It is upright, fairly compact plant of great vigor, self-fertile and heavy yielding. It has bright green, 3 inch long leaves. Pepino melons are consumed for their sweet and succulent taste, and for a number of vitamins and minerals, it comes packed with. This rare fruit has many health benefits and we have enlisted in the top benefits. Pepino melon is considered a powerhouse of antioxidants, vitamin C, vitamin A and beta-carotene. These antioxidants are vital to fighting the spread of cancerous cells. As we all know that we get energy from the glucose stored in our body, derived from the food we eat. Pepino melon has certain compounds that break this glucose into bursts of energy, and you feel recharged instantly. These glucose cells otherwise get stored in your body as fat. So the next time you are feeling weak, grab a pepino melon and experience some good energy. Pepino melon consists of high soluble fiber content that keeps cholesterol levels in check. Soluble fiber does not affect cholesterol directly, but binds the bad cholesterol and excretes it from the body. Soluble fiber can decrease the absorption of low-density lipoprotein (LDL) cholesterol into your bloodstream and let the high-density lipoprotein do wonder for your body. Pepino melon has no sodium but a considerable amount of potassium, and therefore can be effectively used to regulate high blood pressure. Potassium helps to balance the negative effects of salt, and in turn, helps to lower the blood pressure. Pepino melon is also known for its diuretic properties. Less the fluids in your kidneys, the lesser is your blood pressure. Pepino melon can help people who have liver diseases. Strengthening the liver is one of the best ways to boost energy, balance weight and strengthen overall health. Fiber in pepino melon removes toxins from the body, cleansing the liver and boosting its overall health. Since the liver is the core of many bodily functions, a healthy liver makes your overall health. Pepino melon has been known to possess anti-inflammatory properties and can be helpful to sooth pains and aches throughout the body. In the natives where it is grown, the fruit finds its use as a traditional goes to food for fighting inflammation. 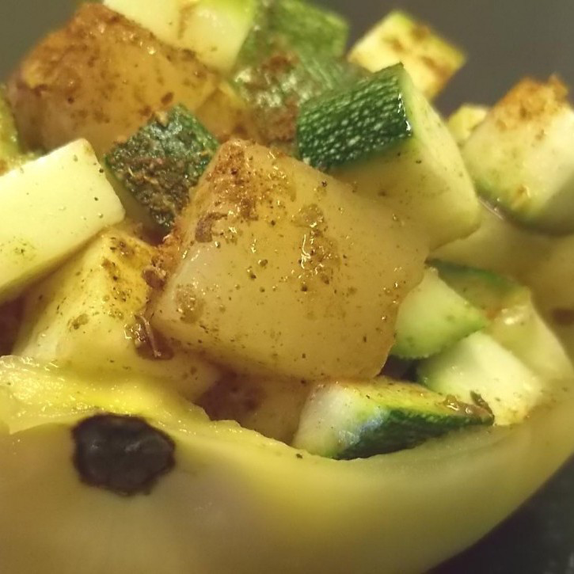 Pepino melon is a wonderful source of fiber and can serve as an excellent remedy for people who have irregular bowels or suffer from constipation. 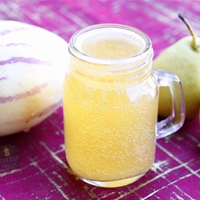 Vitamin C content of pepino melon allows the body to optimally absorb nutrients from food. It can also be used as an excellent remedy to soothe gastric ulcers. Digestive problems affect people suffering from kidney diseases. This fruit could be helpful for them too. We all know that calcium is an essential component for strong, healthy bones. But not many of us know that it is vitamin K that keeps our bones strong and healthy, keeping the calcium in the bones and avoiding it getting gathered in the arteries. Particularly when the bones start to grow weak during aging, vitamin K can still help maintain good bone health. And amongst the sources of vitamin K, pepino melon is a great choice. Pepino melon has calories, but they are stored as carbohydrates. These carbohydrates are broken into glucose by the body and used as a fuel. People looking to lose weight can safely eat it and benefit because it makes the stomach feel full for longer. Anemia is one of the complications of the kidney disease. In addition to the regular treatment, pepino melon could help in the treatment. Person suffering from kidney disease experiences high creatinine levels as kidneys are unable to discharge it from the blood. Diuretic properties of the fruit help in decreasing the wastes through urine from the blood. Fruit is considered beneficial for diabetes and should consume as salad daily. 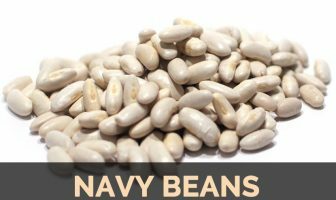 It helps with liver disease, lowers blood pressure, helps those that suffer from strokes to heal faster, and promotes cardiovascular health. Pepino Melon can also help prevent cancer and diabetes, plus lower cholesterol. Fiber present in pepino melon also helps with constipation and it tends to sooth away gastric ulcers too! Raw Fruit is juicy, sweet aromatic and very agreeable flavor somewhat like a honeydew melon. Ripe fruit can be served as a dessert. Their taste is similar to that of melons and mangoes. Unripe pepinos can also be eaten and treated much like a cucumber in salads, baked like a squash and used in a variety of other dishes. Mix with avocado and make a tasty salad. Poach a bit and serve as an ice-cream syrup. Combine it with other exotic fruit in a sorbet. Add fruit to compotes and jellies. Drink freshly squeezed juice straight from the fruit. Mature fruits can be harvested about 5 months after planting, and plants can continue to crop for up to two years. Many pepino-shaped vessels, amulets, and other ornamental have been excavated from Incan sites. 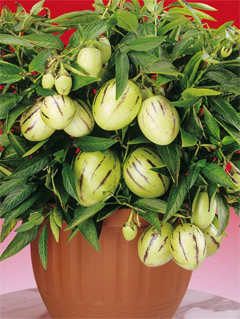 Pepino plants have also been used as ornamental, especially due to the powerful scent that the fruit gives off. You do not have to peel of pepino’s rind because it is very thin and nutritious. Slice it into quarters. Peel of orange’s rind and slice it into little pieces. Put them into freezer and wait for them to freeze before you use it. After you frosted them, put them into blender and chop them up. Add one glass of half skimmed milk and mix it again. Add two or optionally one mint leaf into the mix. Do not use the mint if you do not want it to be fresh. You can add honey if you wish. Put some ice cubes in order to obtain a colder drink. Put it in a big glass and your pepino melon smoothie recipe is ready. You can prepare this delicious smoothie whenever you want and offer to your guests at any time of the day. Seed Rarely formed in cultivated plants. Some fruits may contains tiny, light-golden seeds. If you are suffering from liver disease, you should probably stay away from Pepino, as it might worsen the damage to your liver. Solanum hebephorum Humb. & Bonpl. Solanum hebephorum Humb. & Bonpl. ex Dun. Solanum melaniferum Moric. ex Dun. Solanum pedunculatum Roem. & Schult. Solanum variegatum Ruiz & Pav.